Subjects include whole numbers, fractions, decimals, percents, signed numbers, algebraic expressions, polynomials, linear equations, series, geometry, measurement of geometric figures, graphs, probability, and trigonometry. A detailed study of grammar including nouns, articles, pronouns, verbs, conjunctions, prepositions modifiers, sentences, punctuation and capitalization. Vocabulary and spelling practiced through lessons in synonyms, vocabulary in context and antonyms. Creative writing focuses on the fundamental principles such as plot, structure, character, voice, dialogue, description, and point of view. Students participate in weekly Writing Seminar meetings for oral presentation of student work and peer editing. Non-fiction writing includes book reports, narrative essay, process essay, persuasive essay, compare/contrast essay, and research papers. Students meet in small groups weekly to discuss, respond, and reflect on their reading. Students learn to read for global understanding, developing interpretation, personal reflection, and critical analysis. The shared inquiry approach of the Junior Great Books program is used extensively. The literature chosen corresponds with the history program each year. 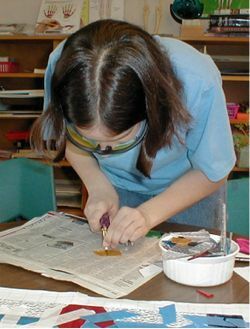 Unit studies integrating reading, writing, craft projects, field trips and performance arts are used to cover topics in American History and civics in depth. Students study the U.S. Constitution, the founding and early years of the United States, the Civil War, Industrialization and Inventions, government, World War I, and World War II. Modern history is discussed through current events. A class trip to Washington, DC completes the course. The study of the world including Egypt, Greece, Rome, the Dark Ages, Vikings, Moors, the Crusades, the medieval period, Renaissance, European exploration of the Americas, the Age of Reason, Africa, the East, and industrialization. This course is designed in conjunction with the literature program. Field trips are also an integral part of this course. Topics include biology, chemistry, astronomy, physics, geology, cosmology, meteorology, botany, and zoology. Emphasis is on experimentation, class discussion and presentations. Extensive field trips including a week long trip to Ferry Beach Ecology School, Boston Museum of Science, Mt. Washington Weather Observatory, Moat Mountain (rock and mineral hunt) and the Montshire Museum. Students choose from 6 languages (French, Spanish, German, Latin, Russian and Japanese). The course uses problem-solving games to develop the student’s ability to learn independently. Specific modules target fluency of expression. This course meets the requirements of the American Council on the Teaching of Foreign Languages (ACTFL) Text: Power-Glide Ultimate Course, Dr. Robert W. Blair. During the 2005-06 school year the students study Italian with weekly courses taught by Anita Earl. After eight months of a curriculum that combines memorization with the real use of knowledge, practice, mnemonics, and cooperative games, students can draw, entirely from memory, detailed world maps which include the names, borders, mountain ranges, rivers, and cities of over 170 countries. Topics include diet, nutrition, good hygiene, daily living skills (planning and cooking meals, gardening, simple mechanics, wood working), family life education, and drug and alcohol awareness. Students also train in CPR and life saving skills in order to obtain CPR and First Aid Certification. Computer applications are used including word processing, spreadsheets, and databases. Students also create web pages, which incorporates the latest in technology (including digital cameras, scanners, video recorders) and software (web-page design software, Flash MX, picture editing). Computer programming is also introduced including Visual Basic, HTML and RoboLab. Course consists of weekly lessons covering technique, music theory, and general knowledge and history of the development of musical forms. Performance of several short pieces at the end of the year completes the course. Students study good health practices and learn the importance of aerobic exercise and muscle strengthening for overall fitness. Daily games of soccer, kickball, volleyball, and capture the flag are enjoyed. Students take downhill skiing or snowboarding lessons for 5 weeks in the winter. Art History including Greek Sculpture, impressionists, Renaissance, cubism, and modern art. Drama including theater production (creative writing and acting). Graphic arts including drawing, collage and painting. Crafts including sewing, knitting, crocheting, black and white photography, quilting, basketry, candlemaking, woodworking, weaving, and papermaking. Field trips: Canterbury Shaker Village, Currier Gallery of Art, Courthald Museum in London, Smithsonian National Gallery of Art. Making a stained glass window. Each year the students take many field trips to both unify the group and compliment their studies. In addition to the annual overnight camping trip in the fall, students take one to two trips per month, culminating in an extensive class trip at the end of the year. In 2003 and 2005, the students went to Iceland and London following a year long study of British and Icelandic history and literature. In 2004, the students traveled to Washington, DC after a year long study of American History and government. In 2006, the students will travel to Montreal. The curriculum for caring includes an in-house service reading with the younger students in the school and a tutorial service for Elementary students. Students also maintain a recycling program. The students raise several thousand dollars each year to fund the class trip. This is accomplished through a class business, a raffle (building a playhouse from scratch and raffling it off), raking, car washes, yard sale, etc. Students maintain a checkbook, savings account, and a budget. Each year the students compete in the Stock Market Game (sponsored by the Union Leader), MathCounts (a middle school math competition), National Geographic’s Geography Bee, Spelling Bee (sponsored by the Union Leader), and RoboCup Jr. (a robotics competition).